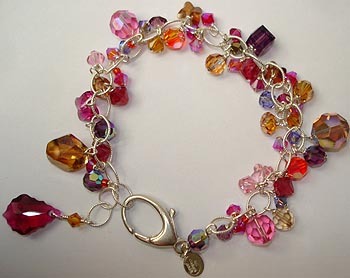 SLC Designs; Unusual handmade silver, gemstone, Swarovski crystal bracelet and bangles. All You Need Is Love Bracelet; handmade sterling silver tag which says 'All You Need Is Love' - with faceted Ruby finished off with a sterling heart toggle clasp that reads on the heart side 'I LOVE' and on the bar side, 'YOU'; strung with Beadalon pro, all metal is sterling. Venetian Turbolenza Fragola (Strawberry Swirl) Bracelet; so cute and dainty, this bracelet features a lovely 24kt gold foiled handmade Murano/ Venetian glass 'strawbery swirl' heart, a handmade goldfoiled Bohemian glass heart, a sprinkle of ruby red aurora borealis Czech glass hearts, Swarovski crystal and goldfilled components throughout. The bracelet measures approx. 8¼ inches/ 21 cm. Seeing Red Bracelet; American Artist-made Borosilicate (Pyrex) glass beads; deep red Swarovski crystal bicones interspersed with Vermeil rondelles, punctuated by gorgeous hand-made glass beads (each one different) which are framed with Vermeil beadcaps. The lovely toggle style clasp is brushed Vermeil; strung on Beadalon Pro. Measures approx. 8½ inches/ 21.5 cm. Amore Murano Bracelet; Venetian glass hearts in palest pink through to deepest ruby with sterling beadcaps and beads and Swarovski crystal with a sterling lobster clasp, heart extender and a hand-made Karen Hilltribe brushed fine silver heart charm - this silver is approximately 99.9% pure silver, a higher silver content than sterling - all other metal is sterling, the bracelet is strung on Beadalon Pro. Swarovski Salsa Bracelet; the colours are straight out of a Bollywood movie, the crystal is Swarovski crystal - I also used Czech seed beads, sterling silver and the bracelet is strung using Beadalon Pro. Measures approx. three quarters of an inch wide and is up to approx. 9 inches / 23 cm using the sterling extender chain. Autumnal Leaf Bracelet; vivid micro faceted Carnelian with carnelian hearts, freshwater pearls, sterling silver, Swarovski crystal, handmade Venetian glass, red Garnet, green Chalcedony, Smoky Quartz, Black Onyx, Turquoise and Green Tourmaline – pretty little bracelet full of charm and movement, measures approx. 7¼ inches/ 18.5 cm. Vivacity Bracelet; Swarovski crystal, some of it antique dating to the 1930's; sterling silver throughout, including the oversized, easy to use oval-shaped lobster-type clasp. Will fit an average size female wrist. Dancing Passion Bracelet; sterling silver with Swarovski crystal dangles, the bracelet moves with the wearer; features a handmade silver-lined Murano glass heart charm. Will fit wrist an average size female wrist.